Arthur William Radford was born on 27 February 1896 in Chicago, IL. He entered the U.S. Naval Academy from Iowa in 1912 and graduated in 1916. His first assignments were to USS South Carolina and as Aide and Flag Lieutenant to Commander Battle Division One during WW I.
Foreseeing the future importance of naval aviation, Radford requested flight training and, upon completion, was designated a Naval Aviator in November 1920. Following a tour in the Bureau of Aeronautics (BuAer), he served with aviation units in the tender USS Aroostook and battleships USS Colorado and USS Pennsylvania. From 1927-29, Radford was attached to the Naval Air Station in San Diego, then headed the Alaskan Survey Detachment investigating forest and mineral resources in Alaska by airborne surveys. He then joined USS Saratoga, Commanding Fighter Squadron One from July 1930 to May 1931 and then shifting to the staff of Commander Aircraft Battle Force. Another tour in BuAer was followed by duty as Navigator of the USS Wright; further assignment to the staff of ComAirBatFor; command of NAS Seattle from 1937 to May 1940; and a year as Executive Officer of USS Yorktown. Radford was then ordered to OpNav as Director of Aviation Training, to the Tenth Naval District to establish and commission NAS Trinidad, and returned to BuAer in December 1941. In July 1943, Adm. Radford was appointed Commander of Carrier Division 11 and led it into action against the Japanese at Baker, Makin and Tarawa Islands. As a result of this campaign he was given the Distinguished Service Medal. For ten months in 1944, Radford served as Assistant Deputy Chief of Naval Operations (Air) in OpNav with additional duty on the Special Joint Chiefs of Staff Committee on Reorganization of the National Defense, then returned to the Pacific as Commander, Carrier Division Six for the remainder of the war. In December 1945, he became Deputy Chief of Naval Operations (Air) and, after a year in command of the Second Fleet, Radford was appointed by President Harry S. Truman as the Vice Chief of Naval Operations. On 7 April 1949, Radford was promoted to the four-star rank of Admiral and assigned as Commander-in-Chief, Pacific Fleet, and as High Commissioner of the Trust Territory of the Pacific Islands. In addition he was given increased responsibilities concerning Military Assistance Programs in Southeast Asia. In 1951, he was assigned as Commander-in-Chief, Pacific Command (CINCPAC) and as Commander-in-Chief, U.S. Pacific Fleet (CINCPACFLT). As Chairman of the Joint Chiefs of Staff, Radford paid close attention to both the tense situation in Korea and to the activities of the French Army and the French Air Force in French Indochina, especially in Vietnam. The crucial turning point in the French struggle against a communist rebellion in Vietnam came during the siege of the French Army in North Vietnam during the Battle of Dien Bien Phu, where it had become completely concentrated and surrounded. At that time, Radford urged the President to send units of the U.S. Air Force to Vietnam to support the French Army. This support was granted in the form of just two B-26 Invader light bomber squadrons of the Air Force. These were sent in what turned out to be a vain attempt to aid the besieged French Army garrison at Dien Bien Phu. In any case, the North Vietnamese communist rebels were able to assault and rout the French Army there, capturing many prisoners. After long negotiations between the French and the North Vietnamese in 1954, the French government decided to concede all of Vietnam north of the 17th Parallel to communist rule. Admiral Radford and his staff had foreseen what would happen following a French defeat at Dien Bien Phu. It has been reported that Radford discussed with the French government the possibility of using nuclear weapons to defend the French garrison at Dien Bien Phu. However, in any case, President Eisenhower declined to take such a drastic and dangerous step into nuclear warfare and, from 1946 on, "nukes" were never used in warfare anywhere in the world. During his second two-year term as the Chairman of the Joint Chiefs of Staff (1955-57), Radford was instrumental in establishing the Navy's program of Polaris missile nuclear submarines, which required the development of all of these: the ballistic missiles, the new ballistic missile submarines to carry 16 apiece of them, and the appropriate thermonuclear warheads for them. This took on elements of a crash program, and the first Polaris submarine, the USS George Washington (SSBN-598), was commissioned at the beginning of 1960, and she took to sea for submerged patrol as a nuclear deterrent. Forty-one Polaris submarines entered service with the U.S. Navy from 1960-67. Also, during his tenure in this post, several of the large Forrestal-class aircraft carriers entered the U.S. Navy's fleet to give it a large amount of conventional and nuclear striking power, especially in the Western Pacific Ocean and in the Mediterranean Sea. In addition, construction work commenced on the two somewhat-improved supercarriers of the Kitty Hawk-class aircraft carriers, and the design work was begun on the world's first two nuclear powered surface warships; the guided-missile cruiser USS Long Beach (CGN-9) and the supercarrier USS Enterprise (CVN 65), which entered service in 1960-61. In 1957, at the end of his second term as the Chairman of the Joint Chiefs of Staff, Admiral Radford retired from active service in the U.S. Navy. • The new anti-submarine warfare-specialized Spruance-class destroyer USS Arthur W. Radford (DD-968) was named to honor Admiral Radford. • Radford High School in Honolulu, HI, was named in his honor. This school, opened in 1957, overlooks Pearl Harbor in Oahu. • On 21 December 1972, the Cubi Point Naval Air Station honored Admiral Radford in ceremonies changing the name of its airfield to Arthur W. Radford Field. 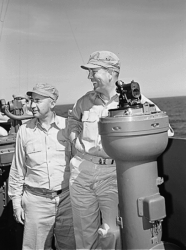 During his retirement, Admiral Radford continued to advise Presidents Eisenhower, John F. Kennedy, and Lyndon B. Johnson whenever called upon to do so; he was also selected as a member of the Draper Committee. 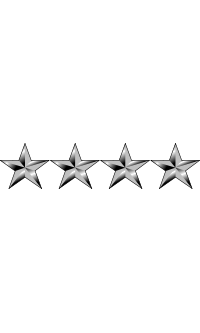 Radford's wife, Miriam, was the aunt of Army four-star general Michael S. Davison. 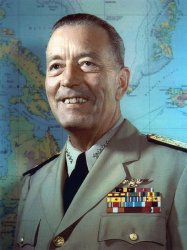 Admiral Arthur William Radford died of cancer on 18 August 1973 at Bethesda Naval Medical Center in Bethesda, MD. He was 77. Radford is buried at Arlington National Cemetery in Arlington, VA. He was survived by his wife, Miriam J. Radford, who died in 1997 and is buried next to him. Arthur W. Radford as Chairman of the Joint Chiefs of Staff Radford (right) with Captain Joseph J. Clark aboard USS Yorktown, October 1943. 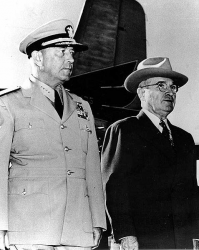 Radford and President Harry S. Truman, 1950.